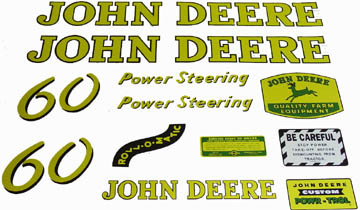 John Deere die cut vinyl decals. Our vinyl John Deere decals are manufactured using the latest technology to ensure that your old tractor will look it's best. Our vinyl decals are not merely a sticker kit. They are made from 3M Scotchcal vinyl – the same material used by NASA. The hood decals in our vinyl sets are created using a computer and cut out with a plotter so that there is no film between the letters. The small decals in our vinyl decal sets still have the clear film. When using a base coat / clear coat paint system, the vinyl decals can be applied to the base coat. Then you can clear coat over the entire tractor including the decals sealing them in the paint. Call for decals not listed. We offer decals in complete sets only.